As a new season arrives and the dark evenings close in, we turn our focus to preparing our winter wardrobe. Naturally, with the cold weather, accessories come into their own - and there's no better feeling than layering up to keep warm - from hats and gloves to solid footwear, ready to tackle the elements that the good old British winter throws at us. To help you, we have chosen to highlight some of our favourite accessories and must-have pieces for your AW15 wardrobe. There's no doubt about it, boots are a staple in our wardrobes for winter but with so much choice it is hard to decide the boot with most flexibility. Hiking boots are fine for hiking but wear them solely for that purpose - keep them locked up otherwise. If we had to choose one pair for the guy wanting to invest in a pair of boots that will work with work clothes or casual clothes then it would be the new Loake Errington brogue boots. They look traditional but have a modern twist and are definitely the style for the modern man. Gents - you have well and truly moved on from your teen days when fingerless gloves were all the rage. You have grown up into a stylish man and you want to keep it that way. Take our advice then and invest in smart looking leather gloves. The time has passed when you could get away with wool gloves. Our Draper Hand Sewn Sheepskin Leather Gloves come in brown and black and with wool lining they will keep you warm whilst ensuring you look the part too. A hat can do no wrong in our eyes. It is the epitome of a true gentleman and has played such a pivotal role in men’s fashion throughout the years. Thankfully - there has been a renaissance and timeless tweed caps, like the Hata Vintage Herringbone Tweed Cap, are the headwear of choice for the guy with style this season. If you are looking to make a style-statement and want to keep your head warm this season then team it with slim-cut jeans and a merino wool polo neck. You will ooze style. Unless you’ve been walking around with your eyes closed, you would have noticed that man-bags are back in style in a big way. Smart looking rucksacks for the office seem to be the norm these days for the on-the-go gent but instead of leather, choose a softer bag like tweed. Tweed is a comfortable alternative and is just perfect for when you need to look smart or for when you are having downtime. Our Highland Harris Tweed Large Rucksack is just the ticket for this AW15 trend-setter. You can totally go wrong when choosing a holdall as there are so many cheap alternatives on the market but if you are looking a practical choice for travel that makes the perfect on-the-road companion, then look no further than our Blakeney Tan Weekend Holdall Bag. Not only is it stylish and smart but it is spacious and perfect for a weekend getaway. Or if you are a globe-trotter and want to have a functional bag to fit your in-flight essentials in then it is ideal for that too. Smarten up your appearance no matter where you are heading and invest in a quality holdall. Get a move on with investing in your winter accessories staples. That way you will start the season as you mean to go on - looking sharp and stylish, no matter what the weather is like. 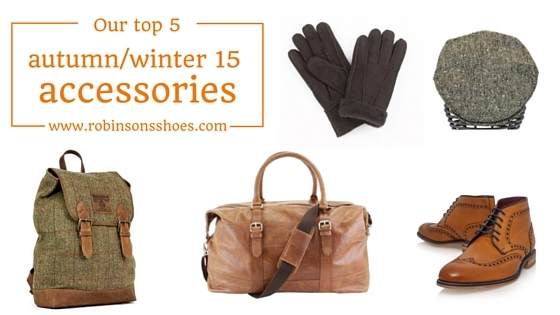 Men's winter accessories are as much about style as they are about functionality.